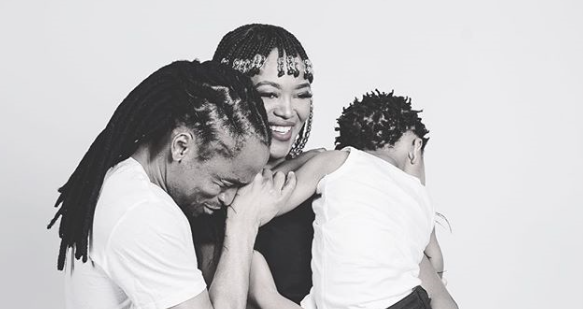 FORMER Miss South Africa Bokang Montjane - Tshabalala celebrates her birthday today and she is using this occasion to count her blessings by paying tribute to the two most important men in her life – her soccer star husband, Simphiwe Tshabalala and her son. A family that prays together indeed stays together. This rings true to Bokang and her hubby. Taking to Instagram account, the star detailed how Simphiwe has been the best husband in the world during their seven year marriage. She also thanked the soccer heavyweight for his unwavering commitment to their family and for constantly praying for the family. he wrote: “THE MONTH OF GRATITUDE,My Birthday Month , 33 things I’m most grateful for as I turn 33. This is literally my life in a pic... 80% of the time I feel like I have two sons ?????? and I wouldn’t trade it for anything... last night my hubby and I held hands to pray and I just kept thinking while praying that Here we are 7 years later still praying together still able to share such moments together and it hit me so hard that God has truly been good to us. My journey with these two has taught me all about “mogau wa Modimo” Gods grace and mercy... am so humbled by how God and our ancestors and guardian angels have managed to surround us and protect us and keep us together... Im just grateful for the gift of family, the gift of time and the gift of love. She finished off the caption in by saying "Monna Waka thank you for continuing to be the best husband in the world,for loving me so deeply with all my flaws and choosing me day in." THE MONTH OF GRATITUDE,My Birthday Month , 33 things I’m most grateful for as I turn 33 #2 This is literally my life in a pic... 80% of the time I feel like I have two sons ?????? and I wouldn’t trade it for anything... last night my hubby and I held hands to pray and I just kept thinking while praying that Here we are 7 years later still praying together still able to share such moments together and it hit me so hard that God has truly been good to us. My journey with these two has taught me all about “mogau wa Modimo” Gods grace and mercy... am so humbled by how God and our ancestors and guardian angels have managed to surround us and protect us and keep us together... Im just grateful for the gift of family, the gift of time and the gift of love. Monna Waka thank you for continuing to be the best husband in the world,for loving me so deeply with all my flaws and choosing me day in and day out. For your unwavering commitment to us and constantly praying for us and with me...To my beloved son, I always thought I was a fighter at heart but now I see I’ve got nothing on you? ?, thank you for fighting against all odds??? ?♥?, thank you for giving me a reason to wake up and push hard to reach all my dreams and goals... thank u for making me laugh so hard... thank you for loving me so unconditionally...out of all the mommies in the world I still can’t believe you chose me to be your mother??♥? Today I am grateful for both of you and for our family... you both bring me so much joy and happiness... kea leboga Ebile kele rata ka pelo yaka kamoka ??? ?♥?